Thank you to fine-jewelry expert Katerina Perez for including me in her “New York in Jewellery” post. CLICK HERE TO READ KATERINA’S POST ON NEW YORK-THEMED DESIGNS. In her introduction, Katerina describes how New York City inspires creative people of all kinds, including jewelers. “New York is a multi-faceted city, and has attracted creative types for decades. They come for its noisy streets, striking architecture and pulsing nightlife. Each artist sees the city through their own lens, and recreates that image in their work. She then goes on to describe jewelry created with New York in mind by A-list designers and major design houses, including Harry Winston, Tiffany, Piaget, and Martin Katz. 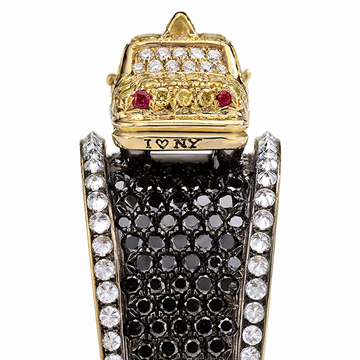 (You MUST see how Autore used gold, enamel, diamonds and pearls in its interpretation of the Chrysler building.) 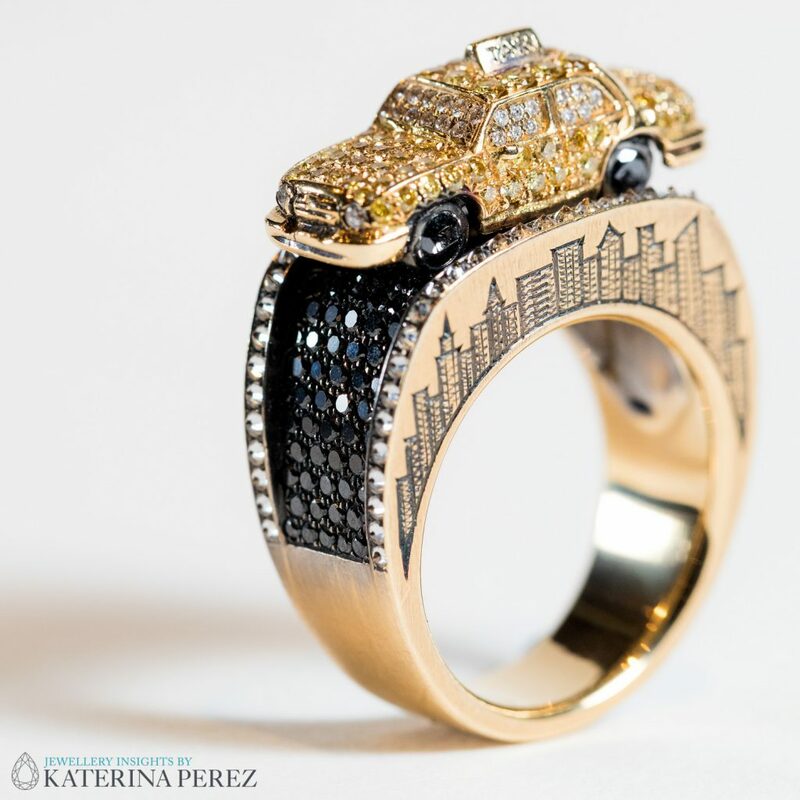 At the end of the list is me and my one-of-a-kind NYC Taxi and Passenger Maneater ring! Katerina’s photo of my yellow-diamond taxi ring. 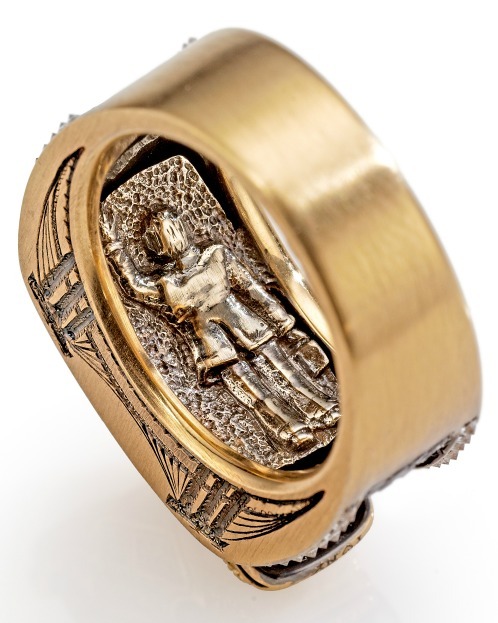 Click for my original post about this ring. Katerina’s photo shows the cityscape-side of the ring. Those of you who are familiar with this piece know that the Brooklyn Bridge is engraved on the other side. At last! A yellow cab that won’t give you a hard time about going across the Brooklyn Bridge. My favorite details have always been the tiny ruby brake lights and the “I heart NY” message engraved on the bumper. Handmade (and engraved) in NYC. Some other people linger over the tiny businessman hidden inside the shank. He was created in 18K white gold and he’s seen from behind, wearing a suit and holding a briefcase, attempting to hail the cab. Yeah, you’re not going to get this cab, little man. If you have a luxury budget, you may inquire about the price by emailing me at info at wendybrandes dot com. The taxi ring and the other Maneater designs ARE all available for purchase even though I have been far from aggressive about marketing them. I’m making slow but steady progress on the final Maneater design — the pièce de résistance showing the mythological roc bird carrying away Sinbad the Sailor. In an ideal world, I would complete that design and then sell entire eight-piece collection to an art/history/literature/jewelry lover who would appreciate having the whole Maneater story at her fingertips. That said, I would never deny a gorgeous New York-loving customer who wanted the Taxi ring as a stand-alone piece. 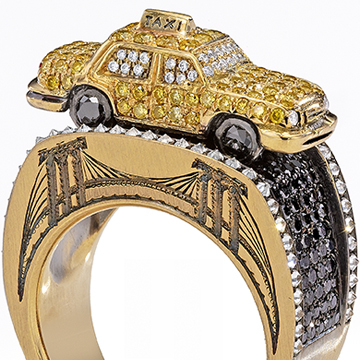 Then, if the collector of my dreams came along, I’d just replace the taxi with an Uber ring! Thanks again, Katerina, for featuring my work.